Happy Birthday Laughs Await! 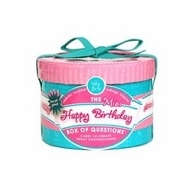 The Happy Birthday Box of Questions is packed with surprises, laughs & Fun. 52 Questions to ask each other and make everyone the talk of the party! Ages: 18 + Great for party Favors or table Decorations. Also available in Large size w/ 52 questions. A great conversation starter game for any party. What three elements make for a happy life? Which of your friends does the best impression of you? What age do you feel is a woman's prime? And a man's?